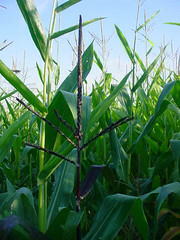 First, though, go check out the Corn Maze page for an awesome photo of the 2006 "Corn Acoustics!" design. 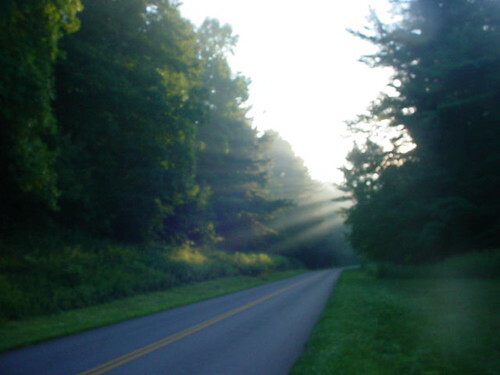 The sky changes through the day; the first hours after dawn were silver and haze, with the rising sun gilding the clouds with gold. Then the sky warmed to brilliant blue, only to pale again with a gathering of clouds. 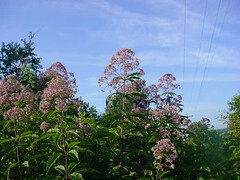 Late summer colors include my favorite lilacs, lavenders and purples. 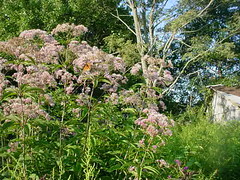 My walk with Lily this morning was rich with color, as tall Joe Pye Weed bloomed rich above thick green masses of ironweed which is just beginning to open. As always, you can click on a photo to see a larger version. 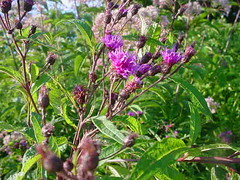 Ironweed is one of my favorite blooms; in the damp field near the creek a huge patch takes over every fall. Lily was too busy sniffing for animal trails to admire the flowers, and I think she wondered what I was making all the fuss about. 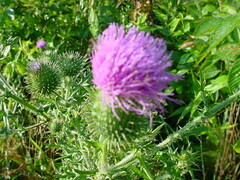 A more carefully kept farm wouldn't have thistle, but it wouldn't be nearly as interesting. We have an abundance of goldfinches and other small birds on the farm, and I think the variety of plant life encourages their presence. Even some of the corn stalks are a deep, rich purple that is almost black. The dark tassels are really pretty, and we should see if there's some craft we can use with them. I don't have the time lately to go out and search for big patches of blackberries, but I enjoy finding these little briars with their bright little treasures! 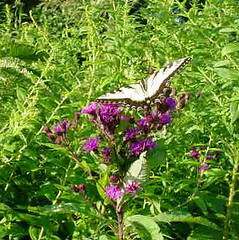 When we came back though the butterflies were out, fluttering around the blooms and lazily feeding. There are lots of butterflies and moths here this year, too. And grasshoppers and spiders. This swallowtail seemed to pose for me; I appreciated the cooperation! 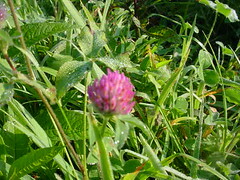 Small blooms in the fields; even though they are little they cast a reddish haze over the meadows, with sparks of white clover and Queen Anne's Lace. 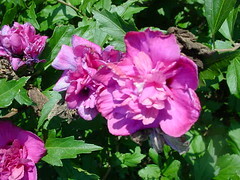 And back to the yard, to be greeted by the sight of the last blooms of the Rose of Sharon by the back steps. Lily snuggled up on the couch for a nap and I headed up to work, ready for a busy day. Lovely, what beautiful purple flowers. 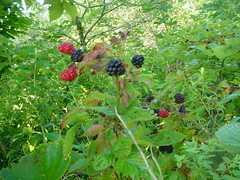 I love wildflowers and wild-growing berries, but you tend not to see them downtown where I live. But I can enjoy them through blogs like this!